That doesn't mean to the Red Wings. If it is some kind of family health issue he is not going to tell anyone at the press conference or any other time. He's always kept his private life pretty private. The media would probably still find out, but he wouldn't be the one to say it. This is what I think is going on - Tampa Bay has not offered Steve a contract extension and I think he's basically saying "you had your chance" and he's stepping aside while still honoring a contract - in a way what is letting the Red Wings and anyone else know - in one year I am available. He can't even talk to the Wings right now, not about team operations. The word is that he's a committed guy and being away from his family was tough on him and he couldn't give his all to the position, and he will be living in Michigan doing his consulting for Tampa from there. His daughters are grown now, so I can't see that being it at this point. Hopefully there isn't any kind of personal or health issue with him or anyone else in his family. It would seem if he was unhappy in his job and returning to the Wings was on his mind, he'd have given Chris Ilitch the heads up before Ken Holland was re-signed. Strange too that he'd wait right before camp starts. I guess we'll have to see how it all plays out. Would it be getting carried away to re-do this song as "He's coming home"? We haven't had 30 years (now 50 years) of hurt though. I imagine commuting from Michigan to Florida takes a toll even without missing young kids. Understandable, having done the commuter marriage deal. But as a wife, I'd be pissed if my husband had spent the formidable years of our kids growing up to pursue his dream career, and then decide after the last one is out of high school that now was the time to come home and be with family. Especially with being so close to a Stanley Cup with the team he had such a big part in building. As a professional hockey player, he's probably spent most of his life "commuting". The timing of it, barring unknown issues going on, seems odd. I don't know if Lisa is all that pissed about the money he's made for his girls. Maybe he just got to the point where he wasn't enjoying the separation and he'd had enough. I think the fact that the team hasn't (to my knowledge) stepped up with a long term deal made his decision easier. No, they haven't won a Cup with him as GM, but they are one of the 4 or 5 favorites every year. Understandable, having done the commuter marriage deal. But as a wife, I'd be pissed if my husband had spent the formidable years of our kids growing up to pursue his dream career, and then decide after the last one is out of high school that now was the time to come home and be with family. Especially with being so close to a Stanley Cup with the team he had such a big part in building. I doubt his wife is pissed at him for choosing to leave his job, but if she is, I highly doubt it is especially because he was so close to a Stanley Cup in Tampa Bay. given england's success rate, i'd rather do another song. They got stomped by the Jackets' prospects in the finals of the tournament, yikes. This is the only game I didn't watch so I guess I will have to watch every Wings game this year. Zadina was pissed he didn't score in the last three games, I love that mentality. No excuses, he just needs to put the puck in the net. He asks a lot of himself and that will get him far. He had 4 points in the 4 games. I thought Cholowski was the most impressive player overall, I'm very excited for his Griffins' season. Rasmussen was as advertised, front net guy who does his job, very strong. Veleno is a beauty of a skater, good passer, shot seems better than people estimated. Smith even looked like he could be a good bottom six winger, skated hard, had some hands, and is tough. I really wish some guys like Berggren were there, but the future could be bright. Pronman at the Athletic put out his pre-season prospect rankings, Zadina is in the elite category and 6 overall. Veleno is a very good prospect at 43 overall. Rasmussen was also very good, 52 overall. Legit prospects: Hronek (58), Berggren (66); Honorable mentions: Filip Larsson. He continues to dislike Cholowski which is surprising to me, I think he should be on the legit prospect list at least. So the defense continues to lag but some good there. I think Rasmussen is being underrated nationally. I definitely would rate him higher than Veleno at this point. Regardless of whether or not we liked the pick at the time, Ras going at #9 overall was not a big reach even then and he has been developing better than expected, IMO. I heard Zadina took a few knocks from the bigger boys this tourney. Pronman has never liked Cholowski but, perhaps grudgingly, had some positive comments about him coming out of this tourney. I don't think Pronman will ever rate Rasmussen high, Pronman is too much of an individual skill/talent guy (I think that's why he loves Veleno, he sees him as a zone entry specialist which is tough to find) so when a guy like Rasmussen's skillset isn't flashy I think it gets discounted. But I think he looked "quiet" this tournament, but overall played a very strong game as he just does his damn job. His size and reach keep making him useful in front of the net on offense and allows him to quickly make net front moves around defenders with his stick. I think he could be very useful day one of this season on the Wings' power play as his touch in front of the net is wild. Pronman's apparent dislike for Cholowski is mystifying....as noted, Pronman values skill and skating. Cholowski is a skating/skills guy. I would think he's at least as good a prospect as Veleno...if not a bit better. I know we need a top pairing Dman...but damn, drafting Hughes would give us a future C depth chart of Hughes/Larkin/Veleno and one of Turgeon or Ehn. And you would have Wings like Rasmussen and AA who are capable of playing C if you would ever want to roll Hughes and Larkin like Babcock used to roll Hank and Pavel on the same line. so this year is the bottom and then we start to see some progress with the young guys? just in time for yzerman to come back and save us. 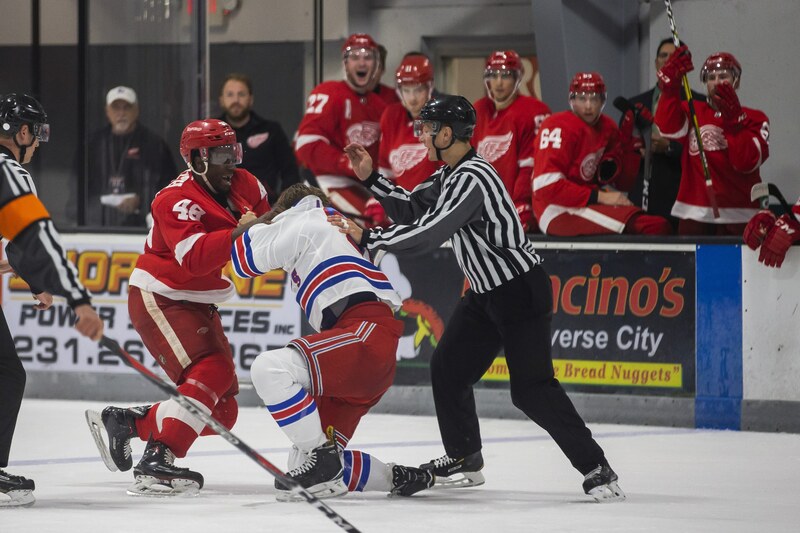 Cholowski’s done nothing but impress throughout the second half of last season through the entire Wings camp, and he’s turned a skeptic in me into somewhat of a believer. Can't say I disagree with any of this. Cholowski has been by far the best rookie and probably their best overall defenseman. Rasmussen does literally nothing flashy but has been solid-ish, although I am hoping for more from him. I really liked Sulak's first game, everything else has seemed like he's pressing too much and he scares the crap out of me when he starts to try to skate it out of the zone with nobody backing him up. Ehn hasn't played enough time but I think he's looked fine in his role. Hicketts was scratched so not shocked he wasn't included. Hronek has had a pretty rough start, I think he gets sent down when the defense gets any sort of health going to get him some confidence and more minutes, then bring him back. I do think it is a mistake that he left Hronek off though, there is no way the Philly goalie at 68 who cleared waivers and is in the AHL should be projected to have a better season than him. Unless Kenny panics next summer and signs a bunch of useless veterans, we he has a penchant for doing. But seriously, I think Kenny may be finally committed to (or forced into with Hank's retirement) actually allowing a full rebuild to happen. they ran some film with Kenny during the pre-game, he said all the right things about being all in on it being a complete rebuild. Now that we have willing, do we have able? I'm as big a Kenny hater as they come. That said, if he had shown a willingness to start this rebuild circa 2014-2015 I would have been on board with allowing him to stay and try a rebuild. However, given the moves he made since then and the ridiculous comments he made, such as rebuilds take 10-15 years, I don't have faith that he is the man for the job when it comes to rebuilding this franchise. Probably won't matter. I have to say I think the writing on the wall that Yzerman takes over this team is about 20 feet tall right now. I'm guessing that having pretty much cleared out the old wood to get things started, Kenny takes some kind of 'upstairs' role, if he doesn't go west. That has been the Ilitch way for all of Chris's life. Don't see why he wouldn't do the same. If they have/had plans to bring in Yzerman why give Kenny a two year contract extension then? The famous line of "we like our team" from the GM might just morph into "we like our GM" from the organization.